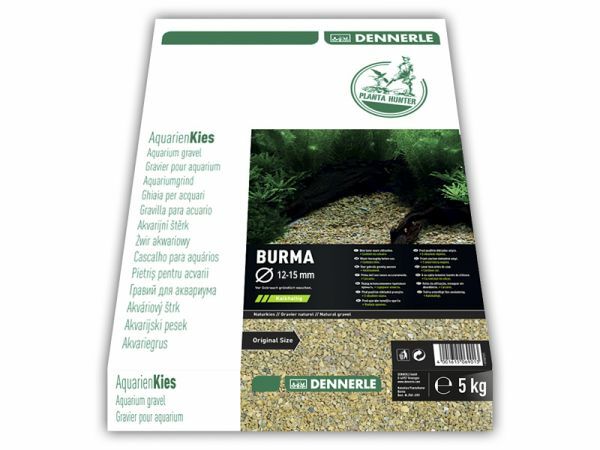 Dennerle Plantahunter Natural Gravel Burma is a 100% natural gravel without artificial colorants, and does not harm any of your tank inhabitants. The choice of the substrate is crucial for the future appearance of your tank. Just like the plants and animals you choose, the substrate is decisive for the character of the aquascape. To achieve a natural look we recommend the use of different grain sizes of the same substrate type and to use the gravel in different areas and levels. For more contrast, you could even use different types. Plantahunter Natural Gravels are ideal for aquascapes as you can easily build true-to-nature underwater landscapes with these substrates. Different colors and forms allow you to create small individual areas, to set contrasts and accentuate your layout. To preserve the natural biofilms, Dennerle Plantahunter Gravel is not pre-cleaned so the aquarium is supplied with an active bacteria fauna that starts reducing organic substances in the water at once. To make full use of this effect, please rinse in cold water only.